+2 Dexterity, +2 Intelligence, +2 Charisma, –2 Constitution, –2 Wisdom: Half-faerie dragons are charismatic creatures, quick in both body and mind, but they suffer from distinctly fragile bodies and a lack of restraint and common sense. Humanoid: Half-faerie dragons are humanoids with the draconic subtype. Slow Speed: Half-faerie dragons have a base speed of 20 feet. Small: Half-faerie dragons are Small creatures and gain a +1 size bonus to their AC, a +1 size bonus on attack rolls, a –1 penalty on their combat maneuver checks and to CMD, and a +4 size bonus on Stealth checks. Butterfly Wings (Ex): Half-faerie dragons possess fully functional butterfly-like wings just like true faerie dragons. Unlike their draconic ancestors, they cannot actually fly because of their frame and size. They are, however, capable of slowing their descent during a fall and using their wings to help them jump and balance, as well as control themselves while flying magically, granting them a +2 racial bonus on Acrobatics and Fly checks. Darkvision: Half-faerie dragons can see in the dark up to 60 feet. Arcane Whimsy (Sp): Half-faerie dragons can use prestidigitation as a spell-like ability a number of times per day equal to their Charisma modifier. The caster level for this ability equals the half-faerie dragon's character level. Breath Weapon (Su): Once per day, a half-faerie dragon can exhale a cloud of euphoric gas in a 10-foot cone. Creatures within the cone suffer euphoria for 1d6 rounds. Creatures affected by euphoria are staggered, sickened, and immune to fear effects for the duration. A Fortitude save (DC 10 + half the half-faerie dragon's class level + the half-faerie dragon's Constitution modifier) negates this effect. Draconic Resistance: Half-faerie dragons gain a +2 racial saving throw bonus against paralysis and sleep effects. Languages: Half-faerie dragons begin play speaking Common and Draconic. Half-faerie dragons with high Intelligence scores can choose from the following: Dwarven, Elven, Gnome, Goblin, Halfling, Orc, and Sylvan. The following feats are available to a Half-Faerie Dragon character who meets the prerequisites. The following classes, archetypes and/or prestige classes are available to a half-faerie dragon character who meets the prerequisites. Physical Description: While half-faerie dragons derive from the rare physical or magical union of faerie dragons and one of any number of humanoid races such as humans or elves, the vast majority of their kind are the children of other half-faerie dragons. While cross-species unions occur, their rarity ensures that they serve only as incidental transfusions of new blood into the gene pool of an otherwise stable, true-breeding population of their kind. True to their origins, half-faerie dragons combine a humanoid form with many of the key and most colorful features, as well as the innate magical nature, of their draconic fore-bearers Most obvious among these features are their wings and tail. Sprouting from between their shoulder-blades, half-faerie dragons possess a pair of elegant, brilliantly colored butterfly wings. Wing colors vary wildly, and the chromatophores along their tips carry this trend further by changing color to match their mood, not unlike those of a chameleon. Their second-most obviously draconic trait is the long, sinuous tail that descends from the base of their spine for several feet at least. It is sometimes as long as they are tall. The appearance of their tails ranges from a more traditional and unadorned—if slender—reptilian tail to one decorated with patches of color, elegant frills, and a glowing tip like the lures of some deep-water fish. For all that they gain from their fraction of faerie dragon blood, half-faerie dragons suffer from a perilously fragile constitution and rarely rise to half the height of their original humanoid ancestors. While half-faerie dragons have fully humanoid heads and facial features, they do possess jaws full of small, sharp teeth rather than the blunter dentition of their non-draconic ancestors. Though their faces provide a familiar countenance and understandable emotional palate to the world, their legs and forearms can resemble the reptilian. Starting at around mid-thigh, many half-faerie dragons possess largely draconic legs, including clawed, reptilian-style feet, slightly longer than those of a human or elf, for toe-walking. Additionally, their legs are largely covered in a fine sheen of scales and occasionally, larger, harder plates at the knee and shin. Their forearms likewise follow the draconic model, with similar scales and fingers tipped with small delicate claws. Some half-faerie dragons, however, possess more human-looking arms and legs and walk around on feet covered in flesh instead of scales. The coverage of scales on the rest of their bodies varies, much like the variation in body hair on humanoids. Most half-faerie dragons—both male and female alike—possess more fine scales, which are usually along their sides, spine, and across their shoulders. These scales typically have a more muted color presence than scales elsewhere on their body and have a texture largely indistinguishable from humanoid skin. Beyond their scales, the most colorful aspects of half-faerie dragons' appearances are their hair and horns. Most of them wear their hair long, braiding gemstones and colored or metallic beads into the ends of some lengths, adding to the other baubles and decorations they favor. Their hair usually adopts one typical humanoid color such as blond, brown, black, or red, but it also contains portions that match their predominant wing color. On top of this, many half-faerie dragons further bleach and dye different lengths of their hair into multiple, often clashing colors, with green, purple, blue, and magenta being popular colors. Like true faerie dragons, they possess slender horns that sweep back from their scalp. These usually begin just above their temples and have a slight curve like the horns of an antelope. Horn size varies as does the horns' degree of twist and curvature. Half-faerie dragons view their horns as a vehicle for self-expression, just as they do their hair. Many half-faerie dragons carve ornate designs into their horns that resemble tattoos, adorning them with metallic inlays or gemstone insets. Half-faerie dragons' insect-like antennae, the final element of their draconic ancestry, are usually hidden by their hair. Largely functionless, these antennae often lay back with their hair but gently perk and move according to their emotional state. They provide none of the extended tactile sense that such organs normally offer. When it comes to clothing, half-faerie dragons are creatures of vanity and lovers of color and decoration. Most half-faerie dragons prefer well-tailored and close cut clothing that borders upon the garb of effete nobles, regardless of their own social class. They usually enhance their clothing with magical glamours. Often, their clothing presents intentional—but not exploitive—gaps that display their scales. Their clothing is always cut to accommodate their wings. Among their own kind and in warmer climates, these fashions go to greater extremes, featuring less coverage. Half-faerie dragon culture lacks the social stigma against displaying the body found among most humanoids cultures, which can be traced back to the lack of concern for such matters that dragons possess. Half-faerie dragons living among other races tone down this practice and adopt some variation—usually a more colorful one—of the local fashions. When among adventurers or other travelers, it is not uncommon to find them waltzing about in something they consider perfectly reasonable but that nonetheless draws scandalized glares from others not used to their race's appearance. Ecology & Society: Half-faerie dragons have no true homeland of their own, so they typically wander among other races, usually keeping to themselves or seeking to pass as other, less out of place hybrids. Relatively rare and small in number, they travel alone or with a clutch of close friends. When half-faerie dragons do congregate, normally in communities of their own in forests at the edge of civilization or in small ghettos within the largest of human cities, they usually do so in a cluster of extended families that form a clan with little hierarchy or organization beyond the familial. As whimsical and flighty as they are, titles and rank mean little to them, though they sometimes take them on in a self-appointed fashion, only to change or drop them as they see fit. Relations: Half-faerie dragons generally get along well with any of the more adventurous races, as well as those with a deep appreciation of beauty and those possessing high levels of creative culture. As such, they often fit in among most human cultures, as well as among elves, gnomes, and half-elves. They find dwarves amusing and love the gold and gems that they covet, but this appreciation is often unrequited, with dwarves viewing half-faerie dragons as flippant, mercurial, and annoying thievish tricksters. Half-orcs tend to share the dwarven view, and half-faerie dragons rarely have reason to overlook their hostile overtures as they do with dwarves. Their reception of and by the various monstrous races varies, with the less brutal and less violent ones giving and receiving more approval in turn. More exotic hybrid races such as ifrits, sylphs, and other elemental-touched, as well as plane-touched such as aasimar and tieflings, garner sympathy from half-faerie dragons due to their typical status as outsiders and are often objects of intense curiosity. On the far end of the spectrum of racial outlooks, true dragons tend to look at the existence of half-faerie dragons with half-restrained confusion, and keep a close eye on their treasure while any are around. Alignment and Religion: Just like true faerie dragons, half-faerie dragons are predominantly good aligned, with a strong predilection towards chaos over law. Their impulsive, whimsical, and at times, frustratingly mercurial attitude towards the world can rub others the wrong way, as can their cultural fascination with jokes and pranks. At their worst, however, they are mischievous rather than malicious. They adore humor, beauty, creation, and magic, so they venerate gods who value these same things. Unlike many half-breed races however, they rarely worship humanoid gods. They appreciate those divinities with shared values, such as gods of dreams, love, magic, and trickery, but almost uniformly, half-faerie dragons worship their own pantheon of faerie dragon gods, collectively known as the Laughing Trio. Their primary patron is the god of faerie dragons, Arzridalimax the Whimsical Grin. The other members of the Trio are his twin daughters Carasandrillanoxa and Tsiliamendrae, the Princesses of Mocking Laughter and Endless Amusement, respectively. Half-faerie dragons worship all three of these gods, along with a number of once-mortal saints drawn from their own kind, and they also give a certain amount of frankly lackadaisical and perhaps unrequested veneration of Apsu and Tiamat as the adoptive parents of their own gods. Despite having their own racial pantheon, half-faerie dragon clerics are relatively rare, and even large communities of their kind often possess only one or two clerics and an equal number of lay apprentices. Since they venerate all three deities, their clerics often oversee worship of multiple gods, including those to whom they are not specifically devoted. Typically, a cleric of Arzridalimax holds services for the god's two daughters as well as services in the father's honor. Racially speaking, half-faerie dragons rarely possess the focus and forethought ironically needed to become powerful clerics of whimsical deities. In fact, most priests perform more powerful healing from their bardic spells instead of magic derived from the gods. It is not uncommon to find a priest of the Laughing Trio without a drop of divine power. The members of the Laughing Trio, given their nature, seem to appreciate this sort of atypical veneration and service all the same. Adventurers: Half-faerie dragons are more often than not seen as annoying, oddly-colored pests and never fully fit into most humanoid cultures. Regardless, they are utterly fascinated by them. Stricken by wanderlust and a desire to experience all that is new and shiny in the world, many half-faerie dragons take up adventuring, which lets them explore the world and indulge their inner dragon's desire to find and covet. Given their natural abilities, half-faerie dragons most often become bards, rogues, and sorcerers, but are also frequently bookish wizards or combinations of these classes. Those living in close proximity to fey dabble in druidic magic more than their natural abilities might suggest. Beyond the more magical or stealthy classes, their diminutive nature and their relatively fragile bodies limit their exposure to martial classes. Half-faerie dragons rarely take up arms, but the rare exception does exist. Against all odds of a half-faerie dragon abandoning the more chaotic streaks of their kind and becoming a paladin, a rare few devote themselves to a lawful deity and take up the paladin's oath. Half-faerie dragon inquisitors, serving the Laughing Trio or a chaotic deity are far more common than paladins. Male Names: Zerancandrianoxillon (Zeran), Indigomarionasim (Indigo), Varrakazindrakorian (Varrak), Koratsindirrianomin (Korat), Duskitzandrianinox (Dusk). Female Names: Astridazilindrianoxamilla (Astrid), Melliflourianollomir (Melli), Opalirriamorinoxa (Opal), Zinamorixandrianela (Zina), Syraminxandriladira (Syra). You can exchange one or several of your character's normal racial traits, but of course you cannot exchange the same racial trait more than once. As with any alternate or optional rule, you must first get the permission of your GM to exchange any of your character's normal racial traits for those listed here. Amazing Disguises: “This isn't the half-faerie dragon you're looking for.” Odd-looking and not always accepted by the cultures and races in which they grow up, some half-faerie dragons learn not to be noticed at all, much like their faerie dragon ancestors. Half-faerie dragons with this ability can drape themselves in an illusory glamour to appear as another type of humanoid. Of course, given their vanity, they also use this ability to simply alter their own colors or to make mundane clothing pass for something richer. This racial trait allows a half-faerie dragon to cast disguise self as a spell-like ability a number of times per day equal to her Charisma modifier at a caster level equal to her class level. This racial trait replaces the draconic resistance racial trait. Draconic Claws: Half-faerie dragon claws look more dangerous than they actually are, but some of them have harder, sharper claws like those of true dragons, even if they seem as harmless as those of their kin. Half-faerie dragons with this trait gain a pair of claw attacks as natural weapons, which deal 1d3 points of damage. These claws are a primary natural weapon. This racial trait replaces the draconic resistance racial trait. Draconic Scales: Normally, half-faerie dragons have thin, translucent scales with the feel of normal humanoid skin that provides little bonus beyond vanity. For some, however, their scales possess a tougher, more resilient consistency that provides them with a +2 natural armor bonus. This racial trait replaces the arcane whimsy racial trait. Draconic Sorcery: Empowered by the draconic blood flowing through their veins, some half-faerie dragons are able to tap into their innate sorcerous ability with greater potency. These half-faerie dragons cast spontaneous spells at +1 caster level. This racial trait replaces the breath weapon racial trait. Dragon Type: Some half-faerie dragons have blood that is more draconic than humanoid, though this is not readily apparent. Magic and certain conditions interact with them differently because of their skewed heritage. These half-faerie dragons are of the dragon type, rather than the humanoid type. As a result, they gain immunity to paralysis and sleep effects, as well as darkvision out to 60 feet and low-light vision. Furthermore, items, spells, and spell effects that interact specifically with creatures of the dragon type affect them as if they were true dragons, both for good and ill. This racial trait replaces the draconic resistance and arcane whimsy racial traits. Instead of receiving an additional hit point or skill rank whenever they gain a level in a favored class, half-faerie dragons have the option of choosing from a number of other bonuses, depending upon their favored class. The following favored options are available to all half-faerie dragons who have the listed favored class, and unless otherwise stated, the bonus applies each time you select the listed favored class reward. Cleric: Add +1/2 to the cleric's caster level on caster level checks to overcome the spell resistance of dragons and fey. Druid: Add +1 to the bonus provided by the druid's nature sense ability. Paladin: Add +1/2 damage or healing done by the paladin's lay on hands ability. Rogue: Add +1/2 to the damage done by the rogue's sneak attacks against dragons and fey. Summoner: Add +1 hit point to the summoner's eidolon. Wizard: Add one spell from the wizard spell list to the wizard's spellbook. This spell must be at least one level below the highest level spell he can cast. 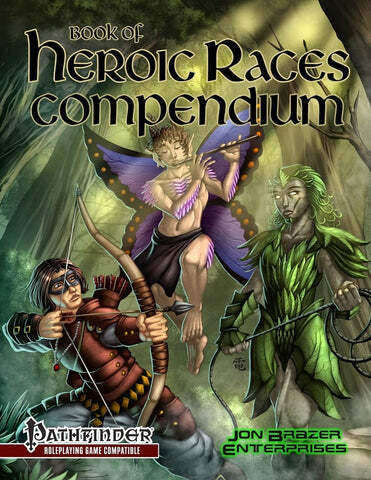 User Reviews: "Book of Heroic Races: Half-Faerie Dragon"
User Reviews: "Book of He...aces: Half-Faerie Dragon"